Sometimes the simplest things taste the best. Just like I sometimes need a break from the rigmarole of everyday life, sometimes my taste buds need a break from complex flavor combinations. 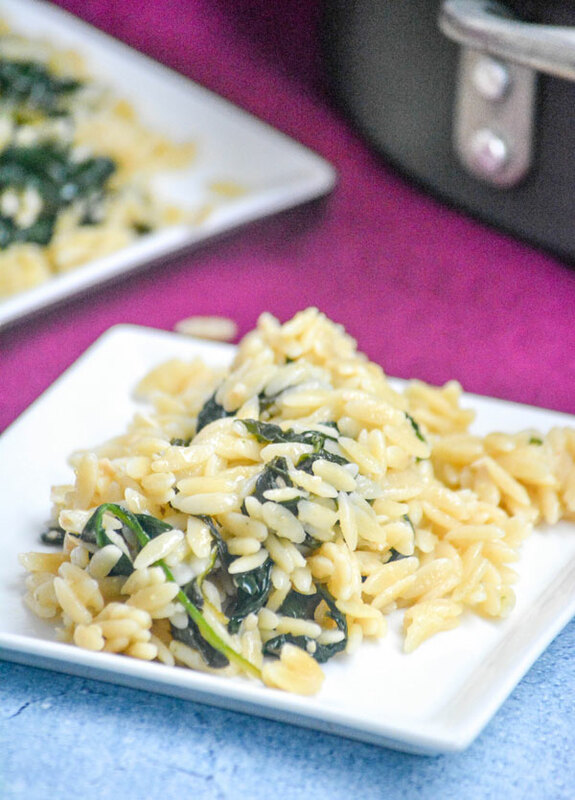 This Spinach Parmesan Orzo is just the thing for times like that. 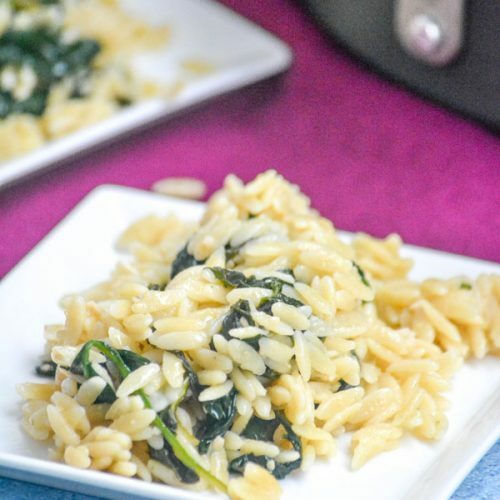 With a simple, yet creamy, low-fat sauce coating the tiny rice-shaped pasta and wilted spinach, it makes a great side dish for virtually any meal you want to serve it with. I think it’s especially yummy with chicken or fish, grilled or fried. Looking for a vegetarian option and thrown by the use of chicken broth? No worries, we’ve already thought of that. You can easily sub vegetable stock or broth, although I’d probably suggest the stock since it’s got a much higher flavor concentration. While this serves 4 people perfectly as a side, if you’re looking for a lighter, Summer-style meal- it’s perfect for 2. Whichever way, however you decide to serve it and enjoy it’s quick, easy, and delicious in it’s simplicity. This is the happy place where health & comfort (food) meet. Other Spinach recipes you might enjoy: Spinach & Cheddar Egg Bake, Creamy Tortellini with Spinach & Tomatoes, Greek Spinach Chicken Feta Pockets, Spinach & Artichoke Bagel Melts. 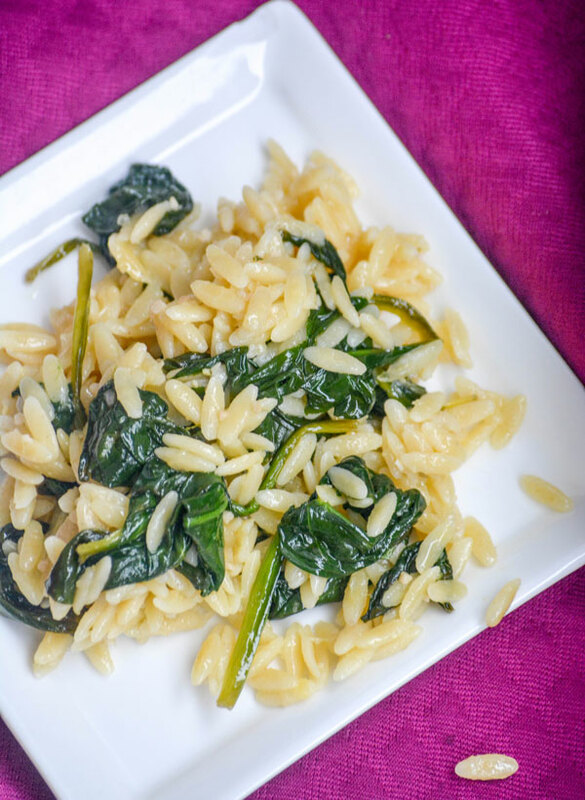 A creamy pasta side dish cooked in a rich broth with Parmesan cheese & fresh baby spinach stirred right on in. 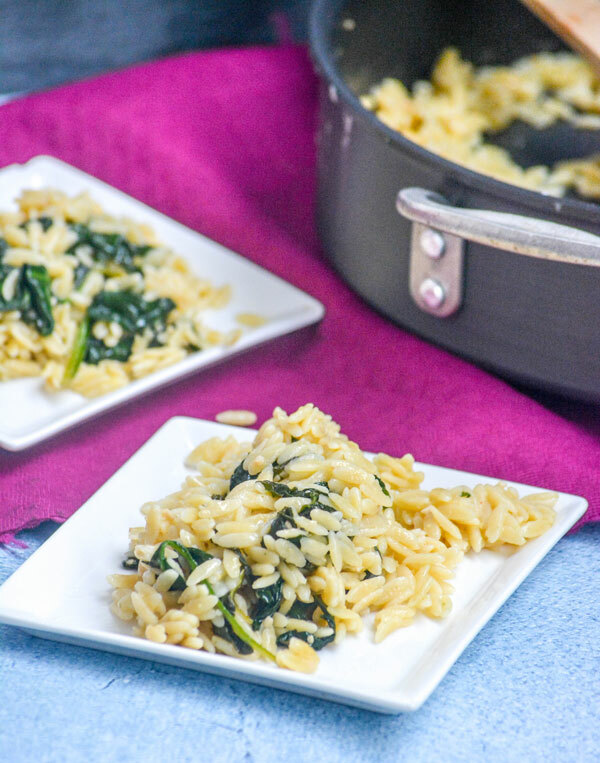 Melt 2 tablespoons of the butter in a medium skillet over medium high heat and add 1 cup orzo. Stir until the orzo is lightly browned/toasted. Add the chicken broth and bring to a boil. Cover. 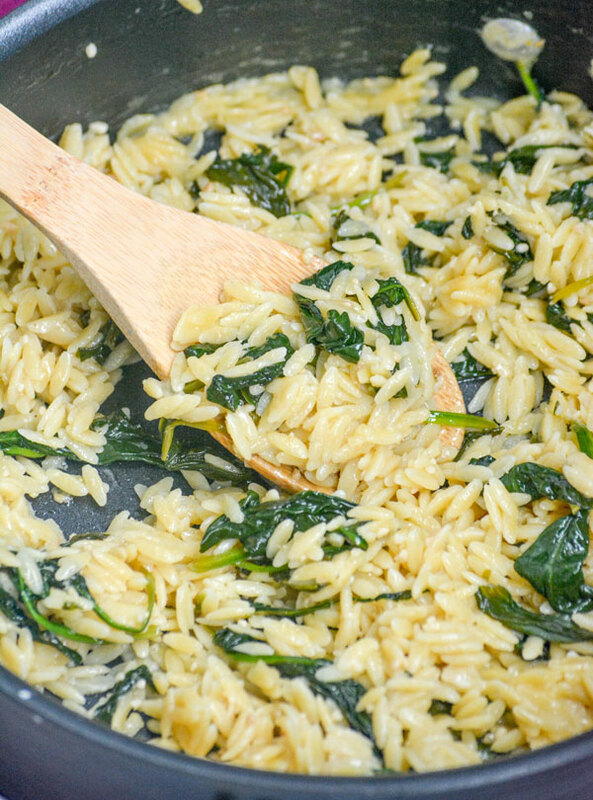 Reduce heat and simmer for about 15 minutes until the orzo is tender and the liquid is absorbed. While the orzo is simmering it is a good time to prepare the spinach. In a large skillet melt 2 tablespoons of butter. Add 1 tablespoon minced garlic and saute for about 30 seconds. Add 10 ounces of baby spinach and a pinch of salt. Saute until wilted. Set aside until orzo is done. 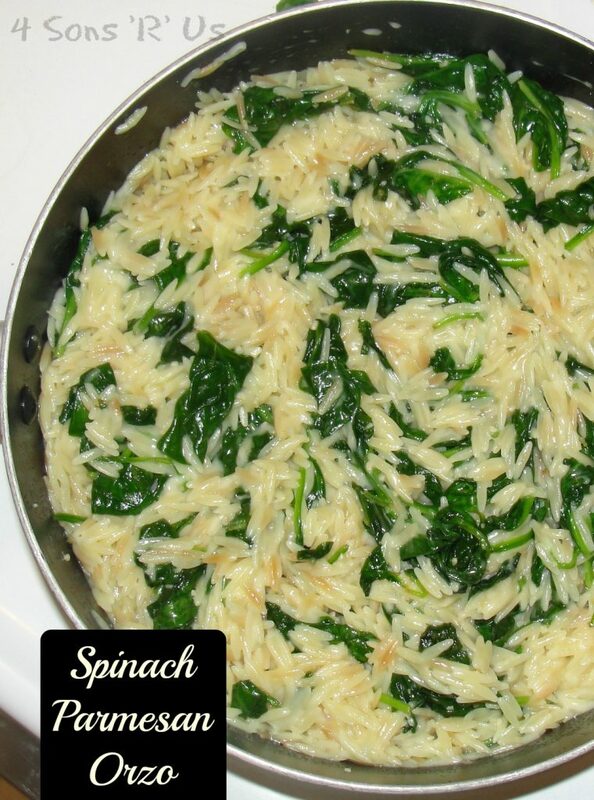 When orzo is done add the spinach and 1/2 cup Parmesan cheese and mix well. Give it a taste and adjust the seasonings as needed. The Parmesan will add some saltiness to the dish, so be sure to give it a taste to ensure you don’t add too much salt! This is the kind of meal I would enjoy tremendously. The other day I made basmati with spinach. it was lovely! I love basmati rice! I may just have to give this recipe a try with a rice base instead of pasta. The idea sounds delish! My favorite way to prepare basmati is making a yellow rice with it. I made this as a side dish to salmon and it was delicious! So glad you loved it, Connie! I usually pair it with chicken dishes, but salmon is a beautiful choice. I can’t wait to enjoy the two together! Thoughts on the flavor profile and substituting vegetable broth for chicken broth to make this vegetarian? Oh, you can totally make that easy swap to go the vegetarian route! It will still be flavorful and yummy, I just personally prefer the flavor from the chicken broth.